Founded in 1786 and incorporated as a city in 1929, Dearborn, Michigan is the eighth largest city in the state, and the second largest city in Wayne County. 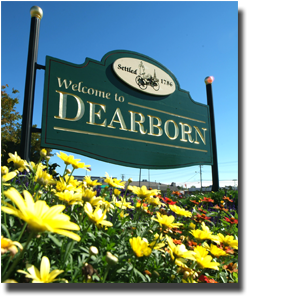 More than 98,000 residents call Dearborn “home” and benefit from exceptional City services. Internationally recognized as the birthplace of Henry Ford, Dearborn is where auto and steel manufacturing, green beltways, fields of sunflowers and wildlife dwell side by side. The city is a regional center for employment, healthcare services, higher education, shopping and transportation along with outstanding cultural, environmental and visitor attractions.